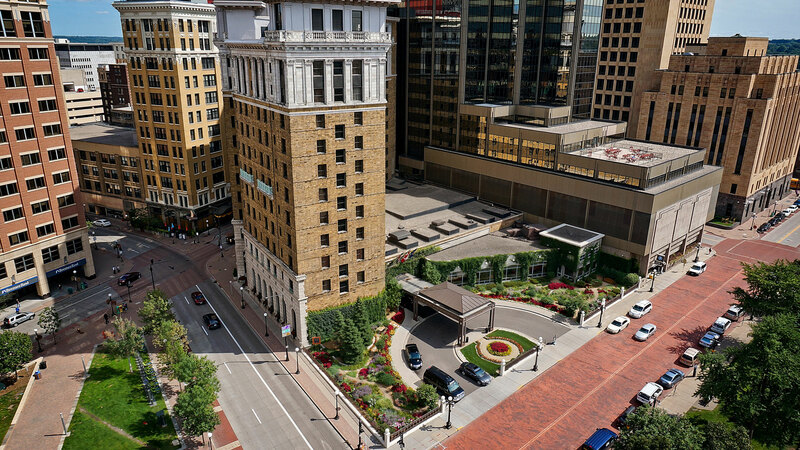 Saint Paul has a diverse and growing mix of properties downtown, including Minnesota's first InterContinental Hotel. Coming Soon! The Drury Plaza Hotel St. Paul Downtown is scheduled to open in late 2019. Located in the heart of downtown near, the Drury Plaza Hotel St. Paul Downtown will be just minutes from Saint Paul RiverCentre convention complex and Xcel Energy Center arena. Celeste St. Paul Hotel + Bar will be a 71-room boutique hotel in a former convent. Many of the building's distinctive architectural features will remain or be repurposed. Plans for this new property located on the edge of the popular Lowertown neighborhood include a restaurant, pool, fitness center and conference rooms. More details to come. 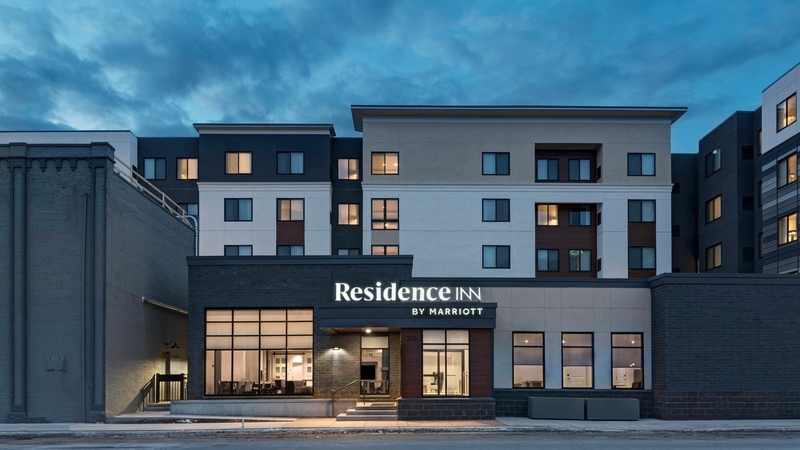 The brand new Residence Inn St. Paul Downtown is located on the edge of iconic Grand Avenue, conveniently located four blocks from the Saint Paul RiverCentre and is next to the West 7th entertainment district. This extended-stay hotel has 100 rooms and 400 sq. ft. of meeting space. The Hyatt Place is now open in the former Saint Paul Post O­ffice on Kellogg Boulevard. As one of one of Saint Paul’s newest hotels, Hyatt Place brings new world amenities to a building on the National Register of Historic Places. Overlooking the Mississippi River, this property has 149 sleeping rooms and 2943 total sq. ft. of meeting space. The Hyatt Place is just five blocks from Saint Paul RiverCentre and Xcel Energy Center. The Hampton Inn and Suites Saint Paul is now open on West 7th Street. This brand new hotel features 160 sleeping rooms and 2,000 total sq. ft. of meeting space. This hotel property has a prime location, just one block from Saint Paul RiverCentre and Xcel Energy Center. 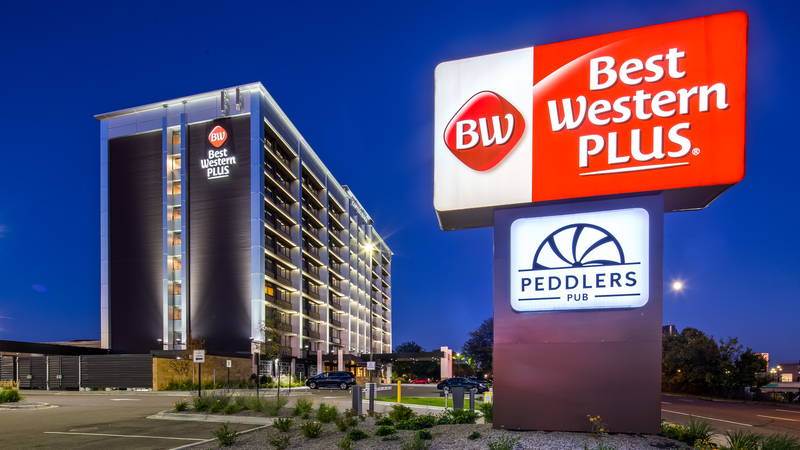 Best Western's proximity to Xcel Energy Center, the State Capitol and local hospitals bring many guests to the property. With the RiverCentre moments away, taking care of business, making those important meetings and zipping around the area is a breeze. A full-service restaurant and bar is available on site, so there’s no need to go far for a great meal. 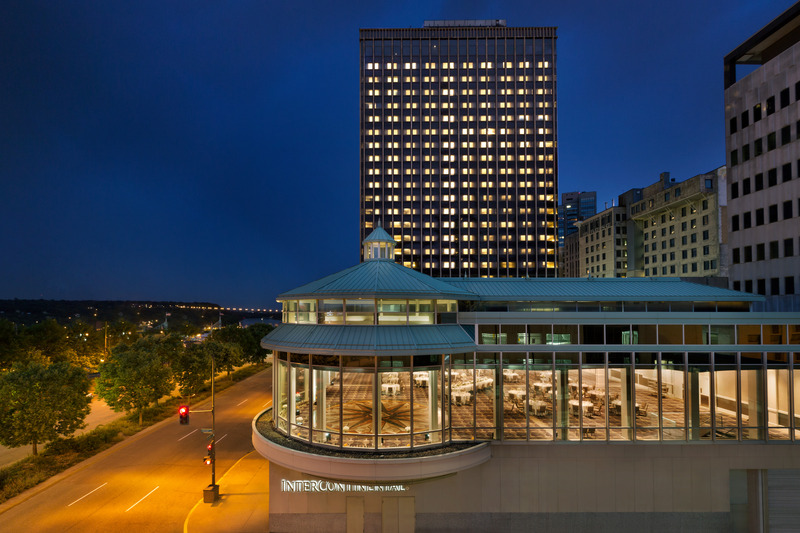 Located in the heart of downtown Saint Paul, the InterContinental Saint Paul Riverfront hotel is the perfect choice for travelers visiting the Twin Cities. The InterContinental is walking distance from popular attractions including the Science Museum of Minnesota, Minnesota Children's Museum, Ordway Center, Saint Paul RiverCentre and Xcel Energy Center. Mall of America and MSP International Airport are just a quick 20-minute drive away. Minnesota's landmark hotel (built in 1910), The Saint Paul Hotel, is a member of Historic Hotels of America and is located just nine miles from the Minneapolis/Saint Paul International Airport and Mall of America. 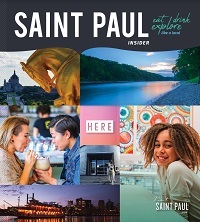 The Saint Paul Hotel combines turn-of-the-century charm with every modern convenience. 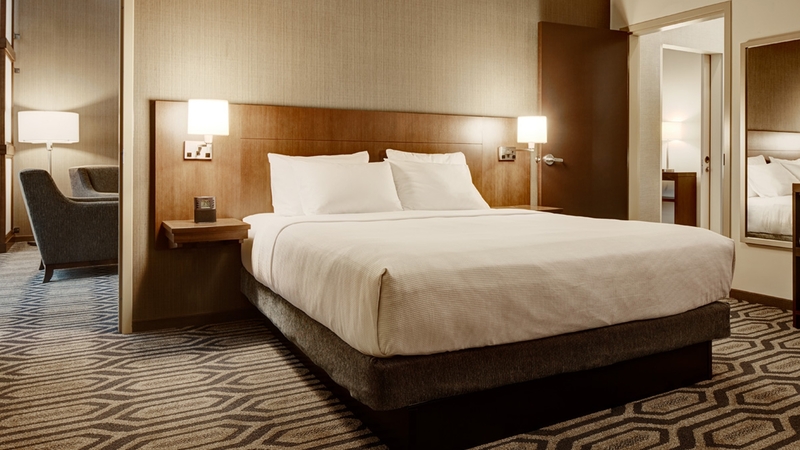 The DoubleTree By Hilton St. Paul Downtown hotel provides upscale, boutique-style accommodations and is ideally situated in the heart of Saint Paul's thriving arts, cultural and downtown business districts. It offers an indoor skyway to adjacent retail space, restaurants, businesses and government centers. 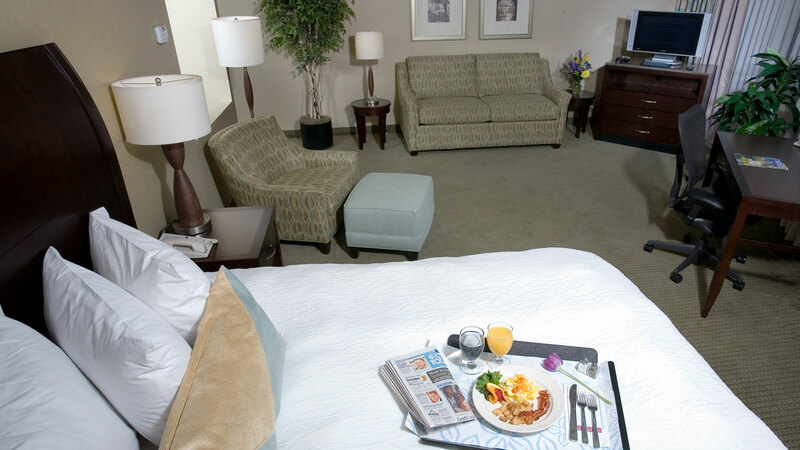 The hotel sits just blocks away from the Saint Paul RiverCentre, Xcel Energy Center, museums and theaters. The DoubleTree by Hilton St. Paul Downtown is located only 10 miles from the Minneapolis-Saint Paul International Airport. The on-site restaurant and lounge, Rival House Sporting Parlour, provides stellar food and drinks alongside classic games like ski-ball and shuffleboard. The Holiday Inn St. Paul Downtown is one of the closest hotels to both RiverCentre and Xcel Energy Center, with complimentary high-speed wireless Internet and meeting space for up to 75 people. It's also home of The Liffey, an authentic Irish Pub featuring a beautiful terrace for outdoor dining. Saint Paul’s newest hotel, Hyatt Place Saint Paul Downtown, in the recently-restored Custom House.